This post is part 6 of a series on the stunningly poor human engineering of production healthcare IT from major vendors, in use today at major medical centers. These devices provide a decidedly mission hostile user experience, yet with an almost religious fervor are being touted as cybernetic miracles to cure healthcare's ills. During the Sunday morning talk show "Roundtable" this morning, I saw an IBM ad touting the fact that they'd surpassed the petaflop mark (built computers that can perform one thousand trillion floating point calculations per second). Now, I am indeed amazed by such machines, and realize their value when utilized by competent domain experts overseeing equally competent analysts and programmers, ideally along with HCI (human computer interaction) experts who can help humans interact effectively with such computational high performance. Amazing. I used to support applications running on IBM POWER-based supercomputers far slower than 1000 trillion FLOPS for drug discovery at Merck, and chatted with those who used these supercomputers in molecular modeling, critical to drug discovery. Today's computing advances are indeed remarkable just a few years later. Here is where my disappointment arises. 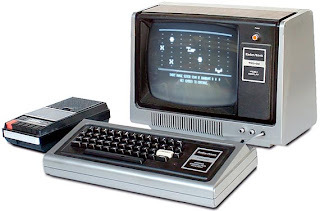 Health IT seems to be back in the TRS-80 days in terms of its failure to utilize these levels of computing power to create a mission friendly user experience and safer medical care. HIT user experience: trapped in the TRS-80 era? Below is how a major healthcare IT system forces a user to do even a simple task, changing the starting date and time for a common medication.Let's count the steps required for what used to require one step: putting the instrument below to paper. Keep in mind, health IT is touted as improving the quality of healthcare, reducing errors, and reducing costs. On the popup subscreen is a list of "standard medication adminstration times" or SMAT's. Here the BID times are shown as 0900 and 2100 (9 AM and 9 PM). CAUTION: If you do not change the [default] requested start data and time, the first dose will be scheduled for the current date and time. Fantastic. The user must then change the requested start data and time to match the SMAT (standard medication administration time) for the first dose. Say they want the first dose to be given at 2100 (9 PM) tonight. In the screen below, the user changed this to 6/5/2006 at 2100 (9 PM) to match the SMAT time. The first dose is to be given at 2100 (9 PM) on the current night. Inadvertently create medication errors? Really? Should be easy to fix with machines capable of trillions of calculations per second, no? Close the patient's chart, and log out of the health IT application. When you log on next time, the time frame will default to Clinical Range. Simple, no? Something we all want our doctors and nurses to be doing day in, day out for just this one simple function, no? Who designed such an interface? What kind of user experience is this, exactly? One designed to make clinical work easier? Are you sure you want to change Amoxicillin to twice daily, 0900 and 2100 (9 AM and 9PM), starting Monday June 5 (Yes/no)? Or are such undergraduate level computer science feats beyond what's "a good business case" for the HIT vendors, thereby banking on the cognitive diligence of healthcare providers to make up for HIT stupidities? Are these vendors aware of fifty+ years of computer science, information science, biomedical informatics, HCI and other research? Who, exactly, is creating, testing and approving the clinician user experiences I am illustrating? Clinicians as technophobes when we're talking about poor IT such as presented in this series? My a**. In part 7 and on we shall start to see the "peek a boo, wild goose chase, go find your lab data" screens I've mentioned. "Buried Data," a "Smoke-and-Mirrors Job" and a "Positive Spin" on a "Cursed Study"
AstraZeneca Plc 'buried' unfavorable studies on its antipsychotic drug Seroquel, according to an internal e-mail unsealed as part of litigation over the medicine. The drugmaker failed to publicize results of at least three clinical trials of Seroquel and engaged in 'cherry picking' of data from one of those studies for use in a presentation, an AstraZeneca official said in a December 1999 e-mail unsealed yesterday under an agreement between the company and lawyers for patients. The London-based company faces about 9,000 lawsuits claiming it failed to properly warn users that Seroquel can cause diabetes and other health problems. 'The larger issue is how we face the outside world when they begin to criticize us for suppressing data,' John Tumas, an AstraZeneca publications manager, told colleagues in the e-mail. One unsealed document showed AstraZeneca officials considered Trial 15, one of the studies Tumas described as 'buried,' to be a problem because it didn’t produce favorable results on the issue of weight gain for patients taking the drug. Gaining weight can be a factor in the development of diabetes. Richard Lawrence, an AstraZeneca official, said in a February 1997 e-mail that the company had engaged in a 'great smoke-and-mirrors job' in dealing with U.S. and Canadian investigators on the trial’s results. 'Adopting the approach Don has outlined should minimize (and dare I venture to suggest) could put a positive spin (in terms of safety) on this cursed study,' Lawrence said in the e- mail. It isn’t clear from the e-mail which person Lawrence is referring to. In his December 1999 e-mail, Tumas said that AstraZeneca had 'buried trials 15, 31, 56,' and was considering a study listed as COSTAR. Details of the trials weren’t specified in the e-mail. Tumas chastised colleagues for using favorable data produced by Trial 15 without disclosing the full study results, according to his unsealed e-mail. The publications manager indicated that AstraZeneca had a favorable reputation for engaging in 'ethical behavior' when it came to disclosing study results on its drugs. 'We must decide if we wish to continue to enjoy this distinction,' Tumas wrote. So here we have more evidence about a big pharmaceutical company suppressing and manipulating data from the clinical research when its results proved unfavorable to its product. The unsealed evidence, when added to many other cases we have discussed, suggest that manipulation and suppression of clinical research data to support companies' vested interests is a common practice by commercial health care firms, including but not restricted to pharmaceutical, biotechnology, and device companies. As we have said before, suppression and manipulation of research amounts to post-hoc abuse of research subjects who volunteered their participation believing that it would advance science and health care. Furthermore, suppression and manipulation of research can deceive physicians into prescribing tests and treatments that will fail to help, or even harm patients, and deceive patients into thinking that they are getting the best possible tests and treatments, when, again what they are getting is ineffective or even harmful. In my humble opinion, there is an increasingly strong argument that clinical research should not be controlled, and probably should not be done at all by organizations with vested interests in the research producing results favorable to their products. See additional comments about the Seroquel litigation on the Clinical Psychology and Psychiatry blog here, and the Carlat Psychiatry Blog here. ADDENDUM (2 March, 2009) - See detailed comments on the apparent manipulation of a meta-analysis of Seroquel versus a "typical" anti-psychotic, haloperidol, on the Clinical Psychology and Psychiatry Blog. In this installment of illustrating defects in today's contemporary health IT, I was going to present more sketches (since contractual clauses between HIT vendors and hospitals tend to forbid sharing of actual screens or defects) of the "let's play peek a boo" variety. I will present them in part 6 instead. 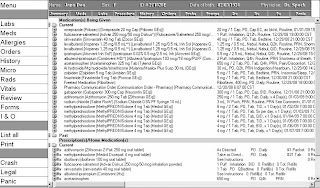 These are screens in which clinicians must scroll extensively to, say, match an INR with a coumadin dose, FiO2 with oximetry result, match systolic with diastolic blood pressure, search around nearly empty screens to reveal a single value many rows down, enter a few common diagnoses via the "clickorrhea" of almost fifty clicks, and other patent absurdities from technology touted as "improving medicine." I am using part 5 to present another issue: A call for investigation of the HIT device industry, its development, marketing, talent management, contracting, QC, and information sharing practices on bugs and defects. I have now become aware of organizations with defects/clinician complaint lists for contemporary HIT including CPOE, EHR etc. amounting to well over a hundred pages in one case, and well over a thousand individual items in another, and numerous unquantified but relevant in-betweens. When I managed Operating room systems for a hospital the vendor was [major vendor, name redacted]. One day I was talking to a representative from [major vendor]. I mentioned their peculiar UI and the guy just didn't get it. He went on to tell me how a single programmer designed and developed the UI all by himself in about a month!!! He thought this was really impressive! I realized in horror, the UI we were seeing every day represented the limited mind of a single technology obsessed programmer who applied his sense of architecture and programming to the patient care routines of operating rooms all across the country. 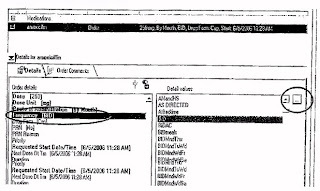 The electronic chart contained the same fields as old papers forms, but the forms took about 3 minutes to fill while the electronic version took 15 AND while that is somewhat acceptable for long cases [I'd say a doable waste of time, not "acceptable" -ed. ], many cases are short, from 15 to 30 minutes and that with the new system the nurse had even less time to take care of the patient - their major responsibility. This is simply stunning. I might also add "frightening." I am working at the [name redacted] University Hospital. I asked several [another major HIT vendor] reps about their screen design and why they do not implement better ones. They said there is not a business case to spend the money upfront to do a proper Information Architecture Plan. I other words, if this is true (and I believe it is from my own experiences with numerous vendors), an HIT company's profits override the issues of a mission hostile user experience and cognitive overload of clinicians. The "business case" means "their profit." Looked at another way, physicians and other clinicians' cognitive energies serve as a bank for HIT vendor deficiencies and unwillingness to develop an appropriate and acceptable user experience. How many patients and clinicians subject to these devices know about these issues? I am going to go out on a limb here, similar to 1998 when I became one of the first (to my knowledge) to publicly stick my neck out with what at that time was a controversial website on HIT failures. Its title was "Medical Informatics and leadership of clinical computing", now here under a new title. I had hoped that the HIT field's problems would diminish with the passage of time and with very direct exposure that all was not well. Instead, it appears the HIT industry and products have gotten worse. The existence of lists of a thousand+ HIT defects in major healthcare organizations, some resulting in clinician complaints about patient endangerment, and unshareable due to contractual gag clauses common in this industry, is simply intolerable. I am told many of these defects will likely never be fixed. I have only scratched the surface in reporting on these issues, being forced to do generic screen sketches, at my series here . There is no spin, no excuse, no dialog that can forgive such a situation. One must ask how products with thousands of defects could get into production. The existence of such lists is prima facie evidence that this industry is itself defective and that these devices are experimental - with clinicians and patients as unconsenting participants. Further, the shielding of the industry from liability on the "learned intermediary" basis is prima facie evidence of misuse of such laws. Even "learned clinicians" are being cognitively taxed and overloaded by these devices; they do not have unlimited cognitive capacity to deal with these defects. I believe this scenario is likely far worse than any practice I saw in pharma. The evaluation needs to go far beyond the CCHIT features and functionality check, an almost useless evaluation criteria in my mind, directly to usability and effectiveness. For a good summary of CCHIT's deficits see p. 132-134 (p. 30-32 of the PDF) in the Harvard Journal of Law & Technology article above. The major problem in HIT seems not absence of features, but a mission hostile user experience. The benefits of EHR systems will outweigh their risks only if these systems are developed and maintained with rigorous adherence to the best software engineering and medical informatics practices and if the various EHR systems can easily share information with each other. Regulatory intervention is needed to ensure that these goals are achieved. Once EHR systems are fully implemented, they become essential to proper patient care, and their failure is likely to endanger patient welfare. Mine may sound like a radical position, but it is not. The existence of such secretive lists and lack of transparency is a highly significant problem. There is no other industry I know of that can push devices with hundreds or thousands of defects, some safety critical and others enhancing risk, onto the public, while preventing dissemination of defect lists. Imagine an aircraft industry where planes in the sky or air control devices have thousands of defects, some potentially leading to collisions or crashes. Pharma is being pushed to release negative trials results, for example. These issues need to be addressed in Washington before we dump $20 billion+ into a defective industry, instead of providing those funds for needed patient care of the poor and uninsured. Electronic health records, or electronic death records? In this fourth installment of a series whose subtitle could well be "hospitals are paying tens of millions of dollars to healthcare IT (HIT) companies for clinical IT designed as if by rank amateurs, while shortchanging the poor and uninsured", we see yet more screens that create a mission hostile user experience to physicians, nurses and other clinicians trying to take care of patients. These hellish user experiences are causing clinician cognitive overload, distracting and tiring them, and due to violations of fundamental good practices in information display, actually promoting error. Perhaps part of the problem is the contractual lack of vendor accountability for bad patient outcomes resulting from defects (i.e., as if "learned intermediaries" have unlimited cognitive energy to deal with a poor user experience), and contractual gag orders on sharing actual screen shots. This forces me to draw mock ups to illustrate the problems. I am aware of major medical centers with lists of HIT user experience problems in recently acquired systems that are 100+ pages long. What percentage of these issues present possible patient risk is not known to me, but I will venture that it is a considerable percentage. Who is designing such medical devices? Who is testing these devices before release for use on patients? The user experience good practices violations that are committed here are numerous and inexcusable. There is repetition, extraneous information, lack of focus and clarity, lack of any symbolic or diagrammatic representations, and general clutter. When I write that HIT is designed by business computing personnel as if it were an inventory system, not a clinical device, this exemplifies what I mean. Imagine clinicians forced to perform their work via screens like this on many patients, each day, day in and day out, and having to make critical decisions on medication orders based upon them. Imagine an on-call physician at 3 in the morning, with more admissions in the ED, interacting with ill conceived screens like this. Madness. Remember, the purpose of HIT is to facilitate clinicians, not tire them and make them drink information from a firehose. It would not have been difficult to condense and organize this presentation into a coherent, focused display that could be used at a glance by a clinician to understand a patient's medication profile. A competent grad student or informatics postdoc in could design such a screen. I know that, because I helped postdocs do such things. Now, how about screens that force clinicians to resort to use of physical digits instead of virtual ones - i.e., their fingers! - to keep track of what's what? Note the row and column headers have scrolled away. The user must hold a finger on the screen to keep track of headings. It is not too diffcult to imagine mistaking one test's value for another. The amount of coding it would take to maintain fixed row and column headers is far less than the amount of cognitive effort clinicians must expend to use such screens. It is certainly less than the efforts spent in making amends for unfortunate patient outcomes such philistine and mission-hostile IT devices create. Such design problems are inexcusable on prototypes, let alone production systems. Where are our government watchdogs on these issues? More violations of simple first principles of providing a good user experience in part 5. It was quite a week in the medical device business. * recommending and advocating to physicians the use of a Current Procedural Terminology code to identify its coblation nucleoplasty technology that was not approved by the American Medical Association and may have not properly described the procedure that was performed. These improper practices identified so far may have occurred since at least 2006. Investigators were informed that certain sales and marketing personnel within the spine unit provided physicians and their billing staff with merchandise and administrative services at no charge potentially in exchange for their utilization of the company’s products. The audit committee has determined that company personnel at all levels lacked adequate health care compliance training and that company billing personnel lacked adequate training and supervision in insurance reimbursement requirements. In addition to considering and implementing remediation efforts, the committee is undertaking a review of such practices in other business units. A Justice Department inquiry into Stryker’s marketing of human bone growth products has resulted in guilty pleas by former company sales representatives. One former sales official pleaded guilty two weeks ago, and another one did in November, court documents show. Stryker, a leading maker of medical devices, and the United States attorney’s office in Boston, which is conducting the inquiry, declined to comment. A spokeswoman for the attorney’s office said the investigation was continuing. The inquiry, which began last year, involves several issues, according to court papers and Stryker filings with the Securities and Exchange Commission. The questions include whether Stryker abused a federal exemption that authorized it to sell only limited quantities of its bone growth products for 'humanitarian' reasons, according to the documents. The two former sales officials pleaded guilty to charges that they had promoted off-label use of the products even though they knew that such use had earlier caused problems in some patients. The products in question are used by surgeons to aid the growth of bones that fail to heal properly. This case is not the only one raising ethical questions about Stryker's management. The inquiry poses new complications for Stryker, which is already operating under federal oversight as a result of an earlier Justice Department investigation of kickbacks paid by makers of artificial hips and knees to doctors. We posted about this previous issue, first here, most recently here. Federal authorities are hunting the mastermind behind a 'horrific case' in which bacteria-laden syringes shipped from an Angier, N.C., plant sickened hundreds of people and killed five. Two men pleaded guilty Monday in U.S. District Court in Raleigh for their roles in ignoring sterility standards at the former AM2PAT Inc. plant. The court heard of conditions at the plant more consistent with a Third World textile factory than a pharmaceutical facility. The men - plant manager Aniruddha Patel and quality control director Ravindra Kumar Sharma - were each sentenced to 4 1/2 years in prison for fraud and allowing tainted drugs into the marketplace. They were rewarded with a relatively light sentence in exchange for information about chief executive Dushyant Patel, whose company sold $6.9 million worth of heparin and saline syringes in 2006-07 that did not undergo proper sterility testing. Dushyant Patel, indicted late last week on 10 charges that include fraud and selling adulterated medical devices, has not been arrested. Authorities think he may have fled to his homeland in India and are seeking help from Interpol. Syringes from AM2PAT were pulled from the market early last year, and the Angier plant shuttered after an outbreak of Serratia, a bacterial infection, hit patients in Colorado, Texas, Illinois, Florida and other states. On Monday, prosecutors laid out a scheme before Judge Terrence Boyle in which the plant's operators routinely failed to follow sterility rules to keep production running faster. The drugs were not produced at the plant, but were loaded into syringes there, then shipped. The plant was subject to U.S. Food and Drug Administration requirements for its production. The syringes were supposed to be loaded in a 'clean room,' with employees in caps and gowns and air carefully ventilated to keep germs from spreading. A photograph entered into evidence Monday shows a 'clean room' refreshed with a common window fan held together with duct tape. In another photo, women work on an assembly line under lamps, surrounded by what look like green plastic recycling bins. Once the syringes were loaded with drugs, each batch was required to be held for two weeks, while employees tested for bacteria and other contaminants. If bacteria were cultured from the medicines, the whole batch should have been held back. That wasn't happening, court documents show. Batches of syringes went straight from the production line into the marketplace, with Sharma falsifying manufacturing dates to make it appear to regulators that requisite quality tests had been done. And when tests were done, results were ignored. In the US, we are undergoing yet another great debate about health care reform. Two big issues are the high cost and questionable quality of our health care. All three of these cases involved behavior that could have raised costs. Two may have had indirect effects on quality. One may have directly caused patient death and disease. Yet, even after executive arrogance, misbehavior, self-interest, and corruption have lead to the global financial meltdown, we are still not really addressing such behavior as a cause of our global health care crisis. NextGen and Vendor/Doctor Dialog: Yet Another Patronizing EHR Company of Certified HIT Experts? To those reading this post via a link in an email from CCHIT's Mark Leavitt, see this June 7th post "Open Letter to Mark Leavitt" first. The link you are at now is several months old, one of many posts I've written over the years about the scarcity of leadership-level Medical Informatics-trained professionals in the health IT vendor world. I consider that issue contributory to EHR's often mission hostile user experience (my series on that topic is here), and ultimately deleterious to patient well-being. I also believe the HIT industry has put its own interests ahead of that of patients in its inattention to HIT safety and rejection of accountability. Additional views on the recent CCHIT NJ Bill are at ePatients.net at "David Kibbe & Mark Leavitt:Openness vs. Opacity" and "Dossia, Microsoft HealthVault & Google Health: Illegal in NJ?". There are some now-familiar themes regarding CCHIT civility in those posts. 6/10: As a result of a link sent by a commenter, I am adding the post "The Kibbe/Leavitt Rumble in the High Tech Jungle!" to the list of interesting views in the note above. My early medical mentor, cardiothoracic surgery pioneer Victor P. Satinsky, MD, believed in public embarrassment (a.k.a. "sunlight") as a tool to fight bureaucracy and discrimination. I quote him on that. He wanted his NSF summer science training progam (SSTP) 10th grade students at Hahnemann Hospital to actually picket a clothing distributor, for example, when that distributor did not deliver our white coats nor a refund in a timely manner. He also was highly politically incorrect, for example having gay activists speak to our group of 200 high school students about bias and discrimination, at a time in the early 1970's when such talks were frowned upon. He took grief for that. Yet fairness and "critical thinking always, or your patient's dead" were his mantras. Dr. Satinsky must be rolling in his grave at what has become of medicine due to the type of bureaucracy we cover here at Healthcare Renewal. He would probably be a healthcare blogger himself were he still alive. Dialog is a useful idea. I am always open to listening. However, dialog must be among equals in an atmosphere of complete transparency. Otherwise it is not dialog, it is politics. How can there be "dialog" in an environment where one side is able to squelch open discussion of the issues? ... p.s. in late 2003 after the collapse of Merck's pipeline, I wrote to your [NextGen's - ed.] CEO and HR department in Horsham about my availability to help in their EHR efforts. This was prior to the bulk of my writings on HIT difficulties. I did not so much as even get a response or inquiry, although I live thirty minutes away. Perhaps you could explore why your company showed no interest in perhaps the only formally trained medical informaticist in this area, and former CMIO of a major hospital in the region (Christiana Care). I found Mr. Jarvis' patronizing "why don't you come and listen" line, sent in a nice soothing blue font, disturbing, since it's vendors (immune from liability and from intra-organization scrutiny even when events such as this and these occur), not physicians and physician informaticists, who need to do the listening. However, something else was at the back of my mind, and information saver that I am (I did run Merck Research Lab's science library and historical science archives department, after all), I checked my disk backups. What I found reflects something I've noted numerous times in the past. Interactions with HIT vendors - both their products and their people - have most often been quite annoying. Charles W. Jarvis FACHE is Assistant Vice President for Healthcare Industry Services and Legislative Affairs – having been in this role since January 2005 [this date becomes relevant as below - ed.] Mr. Jarvis' responsibilities include community and partnership business development including overseeing the company grants and funding procurement program, government relations, new business planning, and educational efforts. Mr. Jarvis is active in the Electronic Health Record Vendor Association (EHRVA), currently holding the position of Chairman of the Government Affairs and Affiliated Organizations Workgroup.Prior to joining NextGen, Mr. Jarvis was in hospital and physician group practice management for 25 years in both the New Jersey and Massachusetts markets. NextGen Healthcare is currently looking for an individual to manage our Industry Relationships. We are a rapidly growing, publicly held company looking for an aggressive, self-motivated individual who is seeking a challenging position with a top tier healthcare IT company. As the Director of Industry Relations, you will be responsible for managing industry relations. This will include relationship management with the consultant marketplace, medical societies, health plans, and our Value Added Resellers. Qualified candidates will have preferably healthcare IT background either as a project manager, consultant, marketing manager, or sales representative . Applicant must also be career oriented, professional, and organized, possess excellent oral and written communication skills and be detail oriented. Working knowledge of MS Excel, Word and PowerPoint a must. Local and national travel required. We would like to schedule an interview for you the week of January 3, 2005. > NextGen Healthcare Information Systems, Inc. I have been away for the New Year. I'm following up on getting an interview schedule set. I also left a voicemail. I have forwarded your resume internally to the appropriate persons. Thank you - you should be hearing from someone shortly. I still await contact from NextGen. Please advise if this opportunity is still available. I am in conversation with other organizations and want to finalize my schedules. I never heard from the company again. In summary, an AVP who may very well have -- hypothetically speaking; I'd never heard of him before he responded to my recent workgroup posts -- made a decision about blowing me off as a Director in 2005 (he started in Jan. 2005) now tells me how I should "come and listen to how the government, providers, insurers and yes- HIT providers- can work together for the common good before drawing such strong conclusions." I can also add that NextGen did indeed hire a medical informaticist straight away from the same program I trained in, Yale's, sometime after that person's completion of a postdoctoral fellowship in July 2006, as a "physician consultant." I had finished the fellowship in 1994 after a number of years of medical practice and by 2005 had quite a lot of applied and management experience under my belt. Lack of recognition of my background, which included extensive clinical, medical informatics and EHR experience and working in a critical role in a quasi-governmental organization with links to several federal agencies? Age discrimination? I was in my late 40's at the time. Perhaps it was felt I had too much experience for the organization? Hiring the young and relatively inexperienced on the basis of "cheap?" My patient-centric advocacy views on HIT, as in, "the patient must be protected from defective HIT?" I am not making accusations in any way, only raising questions. Only the company knows the answers, of course, and it is their right to hire someone or not hire them or even have them in for interview. Even basic courtesy of followup with the professional community is optional. However, I rest my case regarding the really annoying nature of health IT vendors beyond just their often poorly conceived products, and their inability or unwillingness to tap experienced healthcare informatics professionals as I've written about before on HC Renewal. Finally, what is the "American Medical Informatics Certification for Health Information Technology?" claimed in Mr. Jarvis' biography? I have never heard of it before and a Google search seems unrevealing. Could it be an overstated credential to impress stockholders and investors? (We in informatics strive for semantic clarity). AMIA does not "certify" anyone in informatics to my knowledge although they offer a short course in the 10x10 program that awards a "Certificate of Completion in the 10x10 Program." I'm not aware of an American certification board in HIT. Is it like another Htraesian informatics "certification", CPHIMS, as I described here? Is it a certificate like this, which students get after completing the intensive 3-course graduate program in an accredited university that I created? Perhaps something you get after completing one of these programs, created and funded by Don Lindberg and other informatics pioneers, that I spent two years of my life in? Oh, I forgot. In healthcare informatics, everyone's an expert. Finally, I guess I won't be applying to NextGen again. They might blow me off. At the (deliberately) provocatively-titled piece "Are Health IT Designers, Testers and Purchasers Trying to Harm Patients? Part 1" and Part 2, I wrote that I would be presenting mockups showing the EHR deficiencies I am hearing about. These deficiencies in basic human computer interaction, biomedical information science, and presentation of information create a terrible user experience for clinicians. The title of these posts are deliberately provocative because the stakes of the issues addressed are so high. These violations are primarily due to lack of clinician input at design, sluggish vendor correction of reported critical deficits, programmer convenience, contractual gagging of a healthcare organization's ability to share these defects with other users and the public at large, and vendor immunity from liability on the basis of "learned intermediaries" (clinicians) between the defective IT and the patient. ".. no better than than runagates or vagabonds ... shameless in countenance, lewd in disposition, brutish in judgment and understanding ... tinkers, tooth-drawers, peddlers, ostlers, carters, porters, horse-gelders, horse-leeches, idiots, applesquires, broom-men, bawds, witches, conjurers, soothsayers, sow-gelders, rogues, and rat-catchers!" 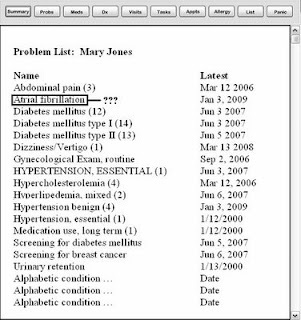 Here is another common EHR defect: the problem list presentation page. 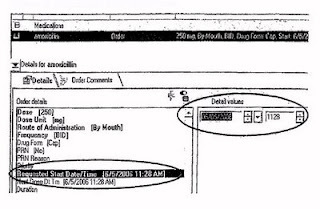 Note that the actual screen is much more dense with other information and smaller fonts than my sketch above, so clinicians have an even harder time than the screen presented here illustrates. This display gives real meaning to my statement that HIT is designed by MIS (business computing) personnel not as a clinical tool but as an inventory system. What is wrong with this display? Let me count the ways. First and foremost, the list is alphabetical. This is very convenient for the programmer, but very inconvenient for the clinician. While just a little bit of clinical and informatics savvy would tend to mandate a problem list ranked or ordered in a priority fashion (e.g., more serious problems first), it's clear that savvy is lacking in an industry that provides a presentation of information clearly unsuited to the purpose of facilitating the practice of medicine! Clinicians are forced to scan the list and use their own cognitive engine to zero in on the most important problems. Any human being, unfortunately, has a limited supply of "cognitive fuel" during any waking cycle, and when it runs out from overuse, fatigue sets in. Why do EHR designers use up that fuel rather than provide interfaces that are more fuel-efficient? Second, this list was auto-populated. Problems and diagnoses were not entered manually by the clinician, but through a (perverse) "artificial intelligence" function created by personnel who probably never cared for patients. 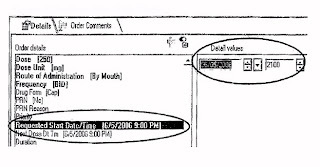 These items were "extracted" from other parts of the chart. For instance, when an order was placed for Mrs. Jones' glipizide sugar pill and a reason entered, the "diabetes" problem was auto-populated. That seems nice, except for a wee problem. Others in other parts of the record who enter notes and orders might also indicate diabetes specified by a slightly different term variant, producing the repetitive clutter you see in the screen above. It serves the clinician poorly to see "diabetes" repetitively, and in correct and incorrect variants (type I was an accident). This auto-population "feature" results in screen clutter and fosters loss of cognitive focus as a clinician reviews multiple patient charts with this same issue. How can this appear in a production EHR system? Mappings exist in any controlled terminology that permit elimination of such redundancies, which further tax the "cognitive fuel tank" of clinicians. Of course, one has to understand how to utilize these mappings and understand the need to utilize these mappings. The motto of this industry seems to be "let the physicians eat the programmer's dust." Third: note the diagnosis of "atrial fibrillation," an irregularity of the heart rhythm that if not treated properly can result in strokes and death. This is an important piece of information for the clinician to know. Except, however, when the patient does not have atrial fibrillation. This entry was auto-populated when a nurse ordered a blood clotting test and erroneously entered the reason for the test as "atrial fibrillation" (a common reason, just not the case here) to expedite the order's completion. Voila! Now Mrs. Jones carries this diagnosis, and the next clinician to come along might order her anticoagulated with heparin or coumadin for a history of A. fib, introducing yet more chance of an iatrogenic injury. And I am told it takes going back to the vendor to have this erroneous entry permanently removed. Sheer idiocy! For instance, if the patient moves to a different unit, is discharged and returns to this hospital, or to an outpatient clinic or another hospital branch with this on the record, the chances of a screwup are not insignificant. Fourth, and this is the most incredible, physicians are not supposed to manually populate diagnoses (in a future installment I will show the madness that occurs when they try), nor are they in this particular EHR given an opportunity to verify or abort the auto-population selections. From a medical informatics (and common sense) perspective, that is simply madness. This is cross-occupational piracy. It is computer personnel and hospital executives "stealing" (overriding) physicians' judgment in identifying their patient's problems the way physicians see fit based on their hard-earned expertise. Do the designers, "certifiers" (this system passed CCHIT certification) and corporate purchasers of such systems have any clue about what they are doing? Microsoft seems to "get it!" (PDF) How long will it take the rest of the world? How about massive screen clutter in some screens (wait until I post the meds list! ), and data sparsity and disconnectedness of medically related values in other screens? How about screens that force physicians to use the "finger on screen method" of correlating lab value to test type? I am told that some of the vendors with products like this sell products to payers that help the payers deny payments on the basis of detecting diagnoses and problems that don't "match" the documentation in ways they deem appropriate. If that is true, they and their corporate customers are truly using physicians as dupes and patsies, forcing them to use ill-designed IT that both impairs their abilities to practice and facilitates payers in denying (or "floating") payments. 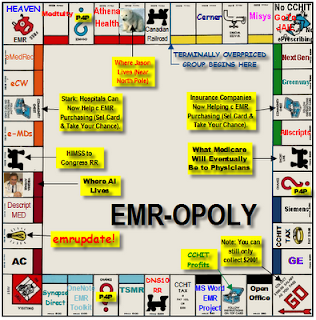 EMR-opoly by Al Borges MD. Click to enlarge. Perhaps says it all about the "EMR game." In the Washington Post is this story of continuing troubles at George Washington University's medical school. The school is currently on academic probation, and despite previous protests to the contrary, its troubles are more than superficial. When the medical school at George Washington University was put on academic probation last fall, school officials said the reasons were mostly superficial matters, such as problems with administrative paperwork and student complaints about a shortage of lounge space. In fact, according to interviews and documents obtained by The Washington Post, the school had deficiencies that were considerably more serious. According to a confidential evaluation document and interviews, GWU has done an inadequate job of monitoring students' time with patients and ensuring that those clinical experiences relate to classroom learning. Student debt levels are among the highest in the country, according to the seven-page letter sent by the accrediting agency in June and later obtained by The Post. Students complained of mistreatment. Problems flagged as long ago as 2001 still had not been addressed when the school was put on probation. The article later provided more detail. The committee cited inconsistent oversight of the clinical experiences in its letter to school officials. Not all the doctors who supervised students at another hospital had faculty appointments at GWU, so there was no guarantee they were reinforcing what students had learned in class. The committee noted pressure to see patients might affect the time doctors have for teaching and research. Problems were allowed to linger. The accrediting committee noted in June, as it had in 2001, that the school still didn't have a system for monitoring student achievement and hadn't reviewed the curriculum to avoid gaps or redundancies. 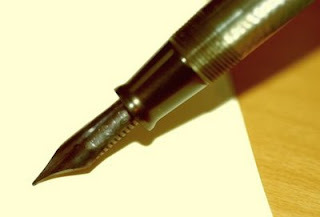 Students complained of mistreatment at higher-than-average rates, according to the letter. Nationally, about 17 percent of students surveyed say they have experienced mistreatment, primarily belittlement and humiliation. Accreditors noted a potential conflict at GWU because the ombudsman who handled student complaints also led the committee that evaluated students. Although it was not a factor in the decision to place GWU's medical school on probation, many people interviewed for this article also pointed to what they consider a potentially serious conflict of interest involving its top official. They said the conflict provided an incentive to keep the institution's focus on improving its hospital's bottom line rather than investing in medical education, research and training. Since 1999, John F. Williams, GWU's provost and vice president for health affairs, also has received money and stock options for serving on the board of directors of Universal Health Services, which owns the university hospital. Williams was paid nearly $680,000 in annual compensation by GWU, according to the university's 2006 tax returns, its most recent, and UHS reported in Securities and Exchange Commission filings that he received compensation from the company that calendar year of $122,000, including stock options. GWU leaders asked Williams to resign from the corporation board and this month accepted his resignation, effective by the end of the academic year. They said his position at both institutions could create the appearance of a conflict of interest. 'No information emerged to indicate an actual conflict of interest,' the university said in a statement. It now seems a long time ago when we first discussed a new species of conflict of interest affecting top leaders of academic medicine and other health care organizations. This species of conflict was simultaneous service on the board of directors of a for-profit health care corporation, which entails fiduciary responsibilities to that corporation's stock holders to maximize profits and improve the corporation's finances, and service as leader of a health care organization which might need to negotiate at supposed arm's length with that corporation. We thought that this species of conflict might be quite prevalent, and quite important in its effects on health care organizations' abilities to carry out their missions. Yet for a while discussion of such conflicts seemed only to appear on Health Care Renewal. Now the new species of conflict are reported in the Washington Post, and deplored by Senator Grassley. Furthermore, there is now at least anecdotal evidence that such conflicts can impede an academic medical institution's academic mission. Now that this problem is achieving some recognition, it may be time to dream about a solution. Hat tip and see further discussion in the University Diaries. 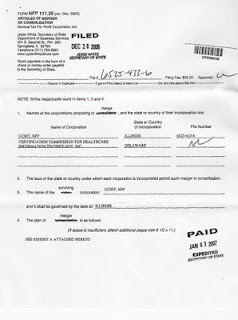 At posts "A very troubling post about the CCHIT" and "Is CCHIT Registered as a 501(c)3 in Illinois, And if Not, Where is it Registered, and Why Was it Involuntarily Dissolved in April 2008? ", I questioned whether allegations by WSJ health blog commenter "CJ" that CCHIT was operating as an unregistered business after an involuntary dissolution (that occurred for some unknown reason on April 11, 2008) were true. CCHIT is the Certification Commission for Healthcare Information Technology, an organization that "certifies" the computer programs doctors are being asked to use to replace paper order sheets and charts in patient care. Today I received public documents from the Illinois Secretary of State's Dept. of Business Services that provide additional information. Click to enlarge. In the document above we find that on Dec. 28, 2006, Articles of Merger or Consolidation were filed with the Illinois Secretary of State, Dept. of Business Services to merge "CCHIT, NFP" (an Illinois Corp). with "Certification Commission for Healthcare Information Technology, Inc.", a Delaware Corporation. The name of the surviving corporation was CCHIT, NFP, to be governed by the laws of Illinois and called "Certification Commission for Healthcare Information Technology" per Article II of the merger (not shown). 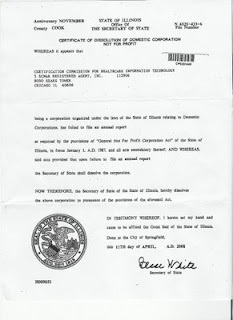 "Certification Commission for Healthcare Information Technology, being a corporation organized under the laws of the State of Illinois relating to Domestic Corporations, has failed to file an annual report as required by the provisions of "General Not for Profit Corporation Act" of the State of Illinois, in force January 1, A.D. 1987, and all acts amendatory thererof; AND WHEREAS, said acts provided that upon failure to file an annual report, the Secretary of State shall dissolve the corporation." 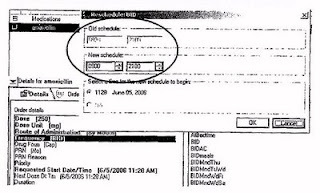 As best as I can tell from these documents, therefore, the Certification Commission for Healthcare Information Technology appears to have been operating as a nonentity (having been dissolved as a corporation) from April 11, 2008 and onward, apparently re-registering on or about Feb. 19, 2009, after the web controversy over registration began. 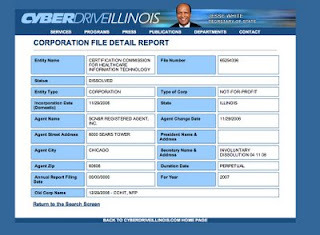 The CyberDriveIllinois site on that day changed to show CCHIT as "Active" with an Annual Report Filing Date of Feb. 19, 2009. Why did they fail to register? Surely they were informed of the dissolution. Why did they continue operating without registration? Who was doing business with them during the period of non-registration? What is the status of certifications performed during that period? What happened to the monies received from HIT firms seeing certification, and/or any monies received from government if any, during the period of non-registration? What are the penalties for operating a business without registration "as required by the provisions of the General Not For Profit Corporation Act" of the State of Illinois? Are there any IRS implications? If the failure to file over ten months or so was due to carelessness, is this an organization that should be "certifying" complex information systems upon which lives depend? Finally ... haven't we had enough of politicians and businesses that "forgot" to file their papers? Being a physician and professor as well as a former Medical Review Officer in the public transit industry, I like to make sure my claims are documented, unlike some with HIT industry sponsorship who prefer speculation. The “facts” in the previous post are deliberate misinformation from an anonymous source ... CCHIT was founded originally as a LLC but has subsequently transitioned to a private, nonprofit 501(c)3 organization. That is its current status. Perhaps Ms. Reber meant to write "that will be its current status once again after we make good on the required state paperwork ten months after we were involuntarily dissolved, after that fact became known through the 'deliberate misinformation' of an anonymous source." One can never tell with those spinning the corporate spin, who seem to think they are dealing with dunces and forget the internet has begun to neuter the power of the corporate spin machine. An individual who practices or holds himself out as practicing a health profession subject to regulation without a license or registration or under a suspended, revoked, lapsed, void, or fraudulently obtained license or registration, or outside the provisions of a limited license or registration, or who uses as his own the license or registration of another person, is guilty of a felony. Finally, these documents cost me $15. Do I have to pay taxes on the $15, or can I file papers to declare myself a nonprofit? "CJ" has brought up the further issue of business licensing requirements by the City of Chicago in addition to state requirements. A comment was received via the blogger comments form that "the City of Chicago confirmed that the Tax & License Authority paid CCHIT a visit on Friday February 20, 2009 to inspect their business license. Effective as of today February 23, 2009 CCHIT is still operating without a valid [city] business license." I will try to verify, and wish "CJ" would provide more information about who he or she is, exactly, but considering the above documents, I would not consider this additional claim unreasonable.